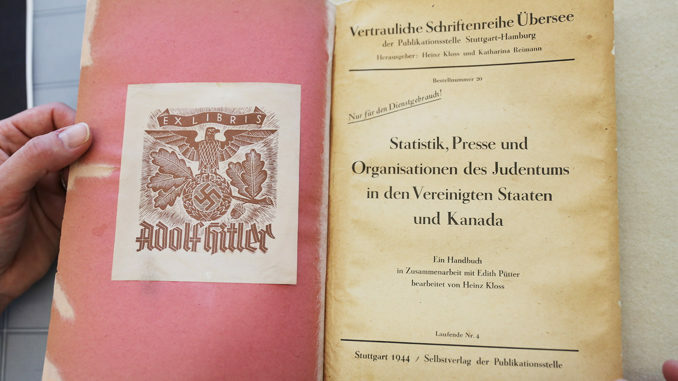 Library and Archives Canada has acquired a rare 1944 book previously owned by Adolf Hitler. The book contains data compiled by Heinz Kloss in 1944 on population statistics in certain cities as well as key organizations and presses of Canadian and American Jewish communities. While the report hints at what might have happened in Canada had the allies lost World War 2, it also demonstrates that the Holocaust was not a purely European event, but rather an operation that was stopped before it reached North America. The public will have a chance to view the book as part of the International Holocaust Remembrance Day Commemoration at 395 Wellington Street on Sunday, January 27, from 1:30 to 3:30 p.m. ET.